For Fr. 60.- the culinary journey begins with the famous mezze: appetizers prepared in many small bowls, the real star of any Arabic menu. This is followed by tender meat skewers, spicy fish dishes, traditional stews and vegetarian delights and ends with homemade, imaginative desserts. Oriental wines, beer, fruit cocktails, Arabic mocha or sweet mint tea are extra. 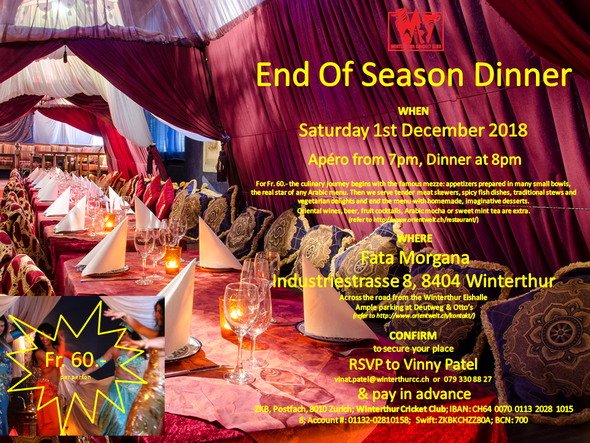 To secure your place simply RSVP to Vinny Patel stating the number of guests and any specific dietary requirements & then pay in advance to the WCC bank account. This year the WCC will experience the Persian & Arabian delights offered by the Restaurant Fata Morgana (Industriestrasse 8, 8404 Winterthur). It is located just across the road from the Winterthur Eishalle (Deutweg) with ample parking at Deutweg & immediately next door at Otto’s (refer to the Fata Morgana website). For further information contact Vinat Patel.